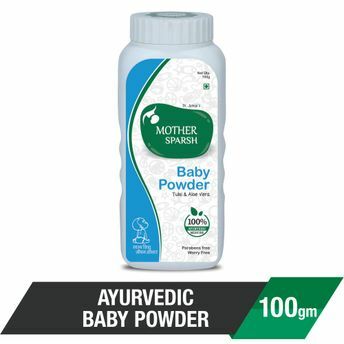 Pamper your little one with Mother Sparsh Baby Powder, it is tailored to protect baby's soft and delicate skin from itching, irritation and other skin allergies. It contains Aloe Vera, Khus and Tulsi which on combination delivers broad spectrum benefits in keeping skin cool and comfortable. It helps to provide cooling effect to babies skin and keep it smooth and supple. Protects baby's skin from itches, infections and rashes. It possess antiperspirant properties and help to provide quick relief from heat. Explore the entire range of Bath Time available on Nykaa. Shop more Mother Sparsh products here.You can browse through the complete world of Mother Sparsh Bath Time .